Ryan Blaney at 2013 Frozen Hog. Photos: Jim Jackson. Scroll for additional photos. 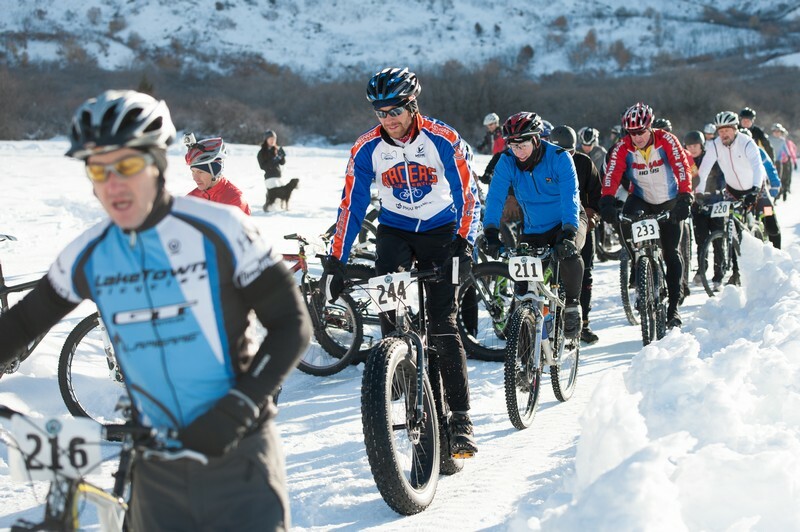 Over the years the Frozen Hog Mountain Bike Race has seen conditions ranging from epic mud to icy hard pack. At its worst the race can be a slushy contest of bike pushing. 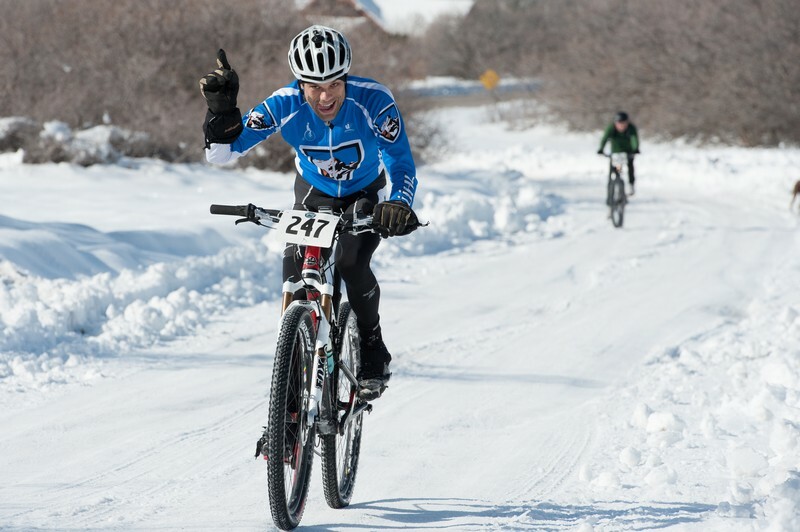 In 2013, the Snow Gods favored racers with 18 inches of snow four days prior to the race, held at Lambert Park in Alpine, Utah on February 2, 2013. The weather leading up to this year's race provided warm afternoons to compact the snow and cold nights to freeze it. The end result was a course that offered prime snow biking conditions. Firm, packed snow and 18 degree temperatures greeted the start of the race. Ryan Blaney (Kuhl) took the holeshot in the LeMans start and was the first one out onto the course. Nipping at his heels was Stewart Goodwin (Kuhl). These racers would battle it out retaining the lead for the expert category the entire race. 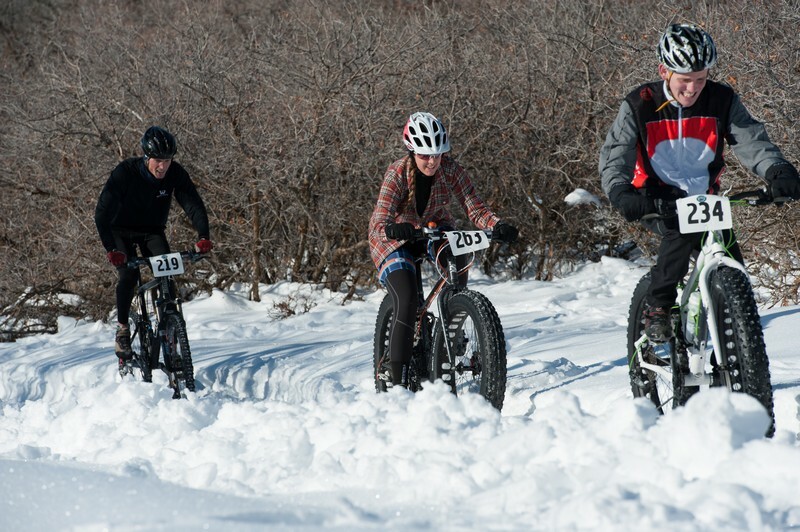 2013 was the year of the fat bike. The popularity of bikes from Surly, Salsa, 9Zero7, and Fatback was evident as biked were staged before the start. Nearly half the field were riding 3.7 inch or wider tires. With the prime conditions the advantage of the bigger footprint wasn't obvious until later laps when the sun began to soften the course. The women's podium was swept by fatties. Which is to say fat tire bikes… ridden by slender, fit women. While Judy Allen rolled her own, Ashley Muhlestein and Lindie DeMill rented bikes from Epic Biking in Saratoga Springs who were at the race offering demos. 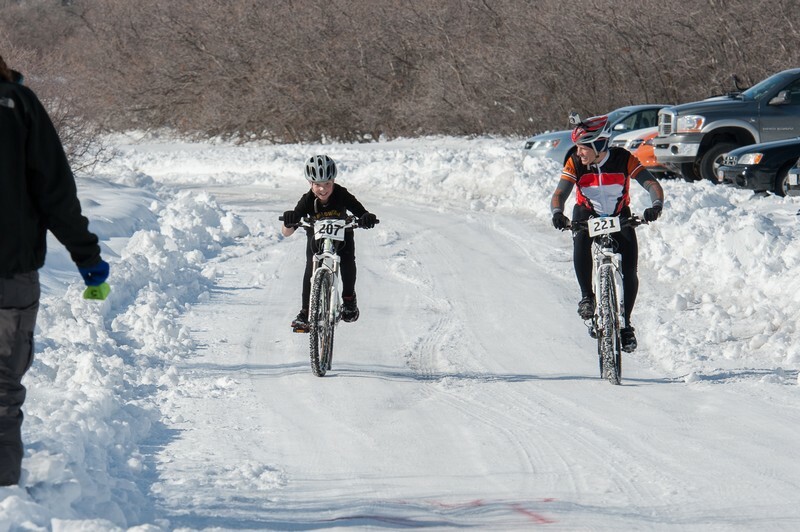 The junior division ranks were pretty thin, but kudos are in order for 12 year old Calvin Thompson who made the Frozen Hog his first “real” XC mountain bike. Hogs Not So Frozen @ 2013 Frozen Hog. Photos: Jim Jackson. Parker Goodwin in single file. Photo: Jim Jackson.